The One Piece brand might not be a household name in the west, but it’s a favorite among anime/manga fans and has spawned a series of videogame adaptations as well. The third in the series was just released, and marks the first PS4 version for One Piece: Pirate Warriors. Here’s our review of the Vita version. 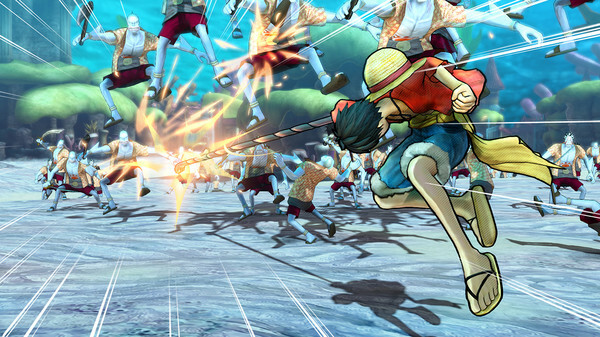 The One Piece: Pirate Warriors games, which started on the PS3 and were introduced to the Vita when the sequel arrived, blend the rich array of story arcs and characters from the anime version with the battlefield-based tactical hack ‘n slash action that the Dynasty Warriors franchise is famous for. Though very similar in formula to the Dynasty and Orochi games, what sets Pirate Warriors apart is its dedication to the source material. In addition to that, a few new twists have been added to the third game – and they all made it across from the PS4 version. For multiplatform Playstation releases that include the Vita, the technological gap had widened. For the Vita’s first two years, its companion system was the PS3 – the platform that was home to the previous Pirate Warriors game as well. With the first PS4 version in the franchise, we feared that too much would be lost in translation now that we’re dealing with a new generation of console computing power. Luckily, the developers at Omega Force have found a clever way to get around this. The massive battlefield in any of the Warriors franchises and games mean that, at any given time, hundreds or thousands of enemies will face you over the course of a single mission. Realizing that this could cause too much of a drain on the Vita’s resources, the number of enemies within a single battle has been downscaled for the portable version. This allows the game to keep running at a fluid frame rate, keeping the combos flowing freely as you mow your way through wave after wave of enemies. Aiding you in doing this are some of your allies from the One Piece universe – characters you can also summon to perform special ‘coop’ moves called Kizuna attacks. An ever stronger version of these, the Kizuna rush, gets unlocked when you charge up a special meter that fills up as you take enemies down. The game also allows for a certain degree of character development as you level up in between battles, unlocking new skills and characters as you progress. Although the basic gameplay rarely changes, it’s the new characters and moves that keep things interesting. Still, this is a game best enjoyed in shorter bursts – and therefore well suited to the Vita. This is especially true for Dream Log mode, which is basically a set of shorter scenarios for you to play through. The campaign/story mode is less geared towards shorter play sessions, but makes up for that with its tremendous amount of fan service. The entire range of One Piece adventures from the past 15 years or so is, in minor or major ways, included in the game. This ranges from (boss) characters to locations, but is especially true for the story development sequences in between your battles. 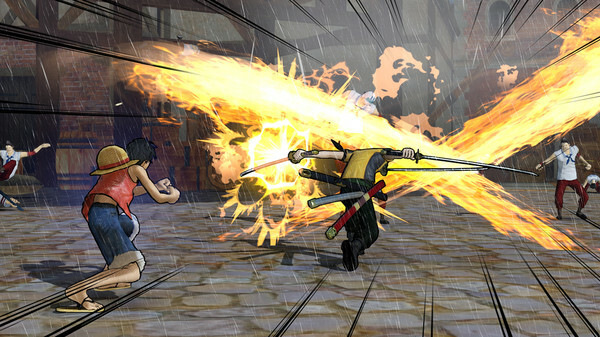 It’s the clashes that you play that link everything together – although obviously some corners were cut in the process of reducing part of the anime’s storytelling to hack and slash gameplay. One Piece: Pirate Warriors 3 for the Vita is a wonderful portable edition of the PS4 game. You’re losing a bit of detail and playing at a lower resolution, but the anime roots of the art style make this a relatively easy change to cope with. The core gameplay is intact, and additions like Dream Log mode make the Vita a wonderful platform with a lot of lasting appeal. The game might became a tiny bit monotonous if you play for longer periods of time after having completed the story mode, but it’s a perfect diversion for short bursts. This is especially true if you’re a One Piece fan, in which case you should definitely grab this as soon as possible.